Both of my daughters like to fish. But my older daughter is pretty much just a smaller (much cuter...) version of me, and this includes her love of fishing. To this day I've never woken her up for a trip and had her say she didn't want to go. Even at 2 or 3 in the morning. Not necessarily normal for a 10 year old, but I'm not complaining. A few months ago I was planning a trip for myself and decided it was probably time to officially initiate her into the club, and to see if she could hack it. So I arranged 3 days of nothing but driving, fishing, driving to more fishing, and more fishing. Abby, her little sister, got a pass on this trip, since she had ballet that weekend, and the trip would have been too much for her anyway. She and her mom got pedicures while we were gone too, so she was happy! We did find a doll that looked remarkably like a toy-version of Abby though. We brought the doll along in her stead as the official mascot of our trip. More on this in a bit. Anyway, we hit the road Friday afternoon and headed towards saltier (more species rich) water. There's enough new (to me) stuff still in Puget Sound that I can usually pick a pier that I haven't been to yet, and scratch up one or two new species per day. So we ended up fishing for the evening at the Dash Point fishing pier north of Tacoma. Nothing new was caught for me though unfortunately, but for the kid it was all new, so she loved it! We walked passed all the people casting for pink salmon and pulled out the bait hooks since that's how you catch the good stuff! And we never saw any pinks caught that night anyway. This one's stripes aren't as prominent as is typical for this species so I took its picture hoping it might be something new. It wasn't. The official mascot of our trip who we named "Tiny Abby" made her grand entrance on this pier. That's Tiny Abby there on the left. I've been trying for a starry flounder for years now to no avail, so that's what I was hoping for. I still didn't get one, but I did get one flatfish. I tried long and hard to decide if this rock sole was anything new or exotic, but it's just a rock sole as far as I can tell. Nerdy note: It's not lost on me that rock sole and northern rock sole are two separate species, both of which are found in Puget Sound, but from my pictures, I can't distinguish between the two species, so it's going to stay just a plain ol' rock sole unless anybody else has any revelatory insights they'd like to share. At least it was a new personal best for me if not a new species. My biggest rock sole so far. From what I can tell, flatfish all have good attitudes, because they're always looking up! Get it? Cause they're eyes are both on the top of their... Oh never mind. You're right that was a bit forced. Brooke learned the proper way to hold a Pacific staghorn sculpin; a quite spiky species! We also got a ratfish just before the sun went down. I've only caught these on one other trip, so it was pretty awesome to see another one, and I'd never seen one caught in the daytime before either! These are still the single weirdest fish I've ever seen. I've noted their forehead clasper before (which has spikes on it by the way), but I didn't notice the large claspers by the pelvic fins before. Or maybe this one just had huge ones... Whatever the case, this one's claspers looked like a couple pairs of hind-legs dangling there! The kid was hoping for a dogfish, and I thought we might get one as evening approached, but it wasn't to be. We fished till dark totally undisturbed by any dogfish, then packed it up and headed to the hotel for about 4 hours of sleep. Bright and early the next morning we hit the road again in time to be at the dock in Westport by 5:30. The kid hadn't ever been out on the ocean before so it was all new and exciting to her, and I was anxious to see if she'd get seasick. We both had on those little sea-sickness behind-the-ear patches, but you never know, especially with kids. Sure enough about 5 minutes past the jetty, the first dude started chumming for us. I was sure she'd join him at the rail, but she just chuckled and said that was gross! No sea-sickness here! She thought going up and down the big waves was fun! I'm afraid the same cannot be said of Tiny Abby however. She got sick and went all rail-bunny on us before we even started fishing. Lucky her big sister was there to hold her hair for her. 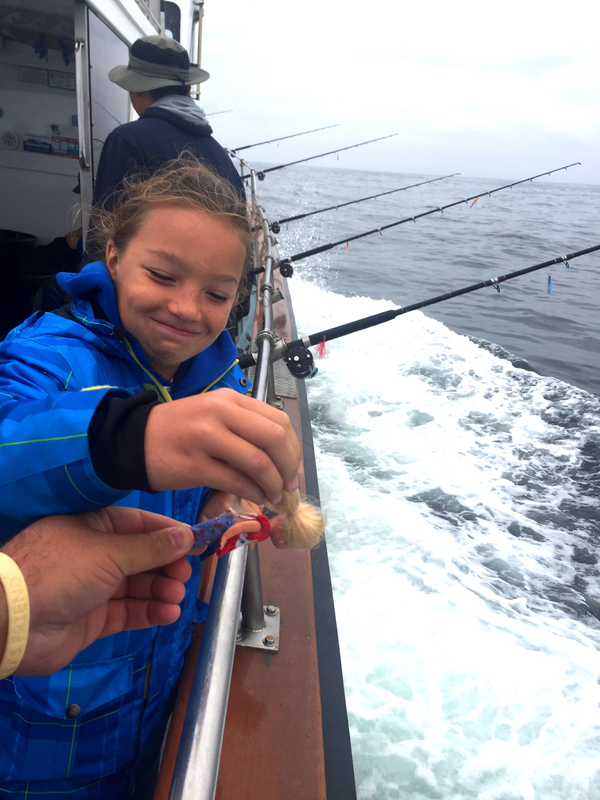 We made it out to the fishing grounds and dropped our gear down 300 feet and soon began catching piles of yellowtail rockfish, often two at a time! The kid's arms were pretty worn out after a few of these, but she hung in there like a champ. Yellowtail rockfish. Not a new one, but definitely still fun! She brought in this double all by herself. These ones were much bigger than I had previously caught, so that was definitely fun. Things did get a little interesting for a while though. I hooked a small fish just a few feet from the surface and began to reel it in. At about that same time I heard a guy say he's hooked a shark. I've wanted a blue shark for years, since I first saw them basking at the surface on a tuna fishing trip. So I anxiously watched as the guy reeled it in. As it turns out, it wasn't even hooked; it was just holding onto his rockfish and trying to eat it! I managed to snap a quick picture just as it let go right at the surface. If you look closely, that's a blue shark thrashing about. So in the meantime, I had also pulled up my little fish, which turned out to be a Pacific chub mackerel (a new one!). We were on a party-boat style trip, so they're all about putting meat on the deck. Which means if it's not a rockfish or a lingcod, they want nothing to do with it. They've got no interest in catching sharks whatsoever. Trust me I asked... I went into this fiasco knowing that was the case so I couldn't complain. But anyway, I quickly snaped a picture of the mackerel since it was a new species for me after all; but then, not being one to waste a perfectly good shark bait, all sneaky-ninja-style, while the deckhand's back was turned, I re-hooked it and nonchalantly sent it back over the rail. Say it with me... Shark Bait Ooh Ha ha! Knowing there was a shark nearby, I just let it swim around, acting all casual. Pretty soon my rod doubled over! No way! I'd actually get a chance at the blue! Unfortunately that's as far as the story goes. I set the hook and it was gone. In hindsight, I probably should have let it eat it for a bit before setting the hook. Next time. Not long after, the captain figured out what I was doing and the gig was up. We had a good chuckle about it. Oh well, it was fun while it lasted! We resumed our regularly scheduled rockfish chasing. It wasn't long at all till the crew decided we had our limits. On my last haul of the day from 300 feet down, I knew I had something heavier on the line. I was both super excited and a little bummed to see my biggest yelloweye rockfish ever pop up to the surface. On one hand, it was an awesome fish, but on the other hand, it had barotrauma like nobody's business, and I'd be very surprised if it lived, even with the captain's deep release mechanism. These can't be kept in Washington, since they're very long lived and prone to overharvest. It was a beautiful fish though! 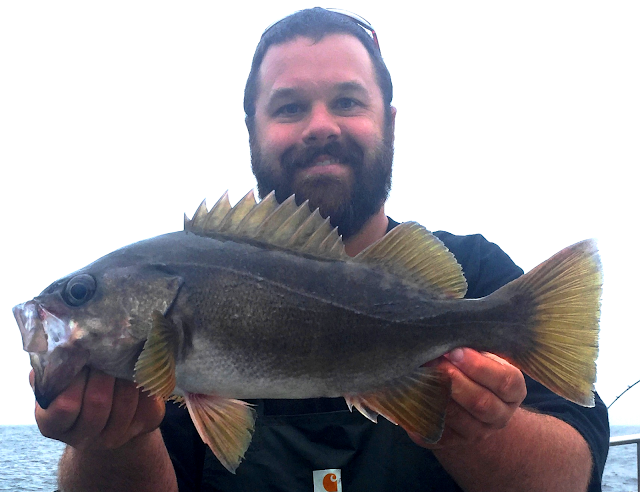 My biggest yelloweye by about 15 pounds! I think they're pretty, though I guess they're sort of like a spiky goldfish on steroids! We finished rockfishing, and then began "lingcod" fishing, note the quotes. I've been lingcod fishing since my early teens, so I'm pretty skeptical that that's what we were actually doing... We sent down some frozen herring to the bottom and waited. Nobody got snagged up and the only fish anybody caught was a nice Petrale Sole (which I was of course immensely jealous of). But anyway, I wasn't super surprised that nobody caught any lingcod over that sandy bottom "lingcod spot". I'm not complaining, just making observations... The trip was still super fun. And more importantly the kid had a blast and never even got the least bit queasy! Tiny Abby got in on the action as the deckhand was cleaning the fish! Naps on the way back to the port are how all the best trips end. That was it for day 2 except for the driving. We headed inland to a stay at my long-lost friend Brenda's house. Faithful Bryanlikestofish readers (you two know who you are) will remember Brenda from my days tagging steelhead on the Snake and Clearwater rivers. See this post and this post for details. It was awesome to get caught up, and the hospitality was much appreciated as we got ready for our day 3 shenanigans. Our target for day 3: our first lake trout! We met up with Gabe, another buddy, at his house and jumped in with him and soon launched his boat on a nearby (undisclosed) lake, sent down the downriggers, and began trolling. I can't think of any witty quips to liven up this part of the story, so maybe insert your own joke here if you like... But definitely make it better than my flatfish joke for sure. Anyway, long story short, we both ended up getting our first lakers! They were by no means large lake trout, but I by no means cared either. I was just happy to finally add that one to the list! Huge thanks to Gabe! Yes I know, you've caught a bigger one. I'm just happy I can finally check this one off. I've tried more times than I care to admit to get one. Not an unattractive little fella though. I don't know what was up with Tiny Abby at this point, she lost it a little I guess. Brooke was pretty sleepy by this point, but we stuck it out long enough to get her a laker too. But just the fact that she was still smiling after 3 long days of literally nothing but running and gunning, is good enough for me. Maybe next time I'll have to take the little one, and we can bring a "Tiny Brooke" mascot. We'll see. As it was I was more than happy with some great fish, great memories with the kid, and two new species to boot! She's in the club as far as I'm concerned, even if she was concerned that her hair was messy in this picture!